When you login or change items or equipment and it sits there at "loading" for a long time, try clearing your cache and logging in to the game again. This usually solves the problem. Please do not post about it unless it repeats. If it does repeat and there are no previous posts (and it's not mentioned here), please post about it. Temporary items are lost when leaving the game. Health/Mana potions - if you use the "Log out" button on the Battleon town page, you keep any potions you have collected. Note that you must complete a battle after collecting the potions for them to be saved. Clickable equipment -- such as the Eye of Naab, Arkridge, or Beautiful Oblivion -- cannot be used in all armors. If the item is not shown, or the clickable part is offscreen (such as for Necromancer Cloak), it cannot be clicked. These weapons can be clicked when a spell is cast and the weapon is visible. Some weapons can also be clicked when a special occurs. When you click "Attack" on a class armour, and it does a class skill with no MP cost instead, it is not a bug. Some class armors have a small chance to do one of their unique class skills for free instead of doing the normal attack. Paladin level 10 ability does not always activate. This is normal, as it has a 15% chance of activating upon your character's death in the armor. Necromancer/Obsidian Cloak level 10 ability Lich Form - You actually have to die for this ability to activate. It does not allow you to continue your current battle as a Lich. Dracomancer Armor missing some levels. If in the past, your fought the war boss Bradakhan, he had an ability to permanently remove levels from Dracomancers. The only way to regain these levels is to complete the Dracomancer class quest again. Vamp armor heals you 1/4 of the damage yuo dealt, with a maximum of 20 HP. The maximum is not a bug. If your Armor has an attack of a specific element (e.g. many class abilities), the Armor's element is used instead of the weapon's, even if the weapon is triggered to do another element UNLESS the weapon is triggered to do Void damage. Golden DragonSlayer (Eclipse) uses both your DragonSlayer level and your VampireSlayer level. This means that with 0 DragonSlayer and 10 VampireSlayer, your class level is 2 in GDS(E) - and with 10 DragonSlayer and 0 VampireSlayer, your class level is 8 in GDS(E). If your Armor has an attack of a specific element (e.g. Golden Dragonslayer and many class abilities), the Armor's element is used instead of the weapon's, even if the weapon is triggered to do another element UNLESS the weapon is triggered to do Void damage. Some weapons that have variable damage based on character level, (the Blade of Awe and Soul, Power and Spirit Katanas for instance) do not display their actual damage. This is intentional and is actually done to prevent certain types of bug abuse. Big 100k triggers on Draegan Avenger and Drowned Angry Rat. Yes, they count as undead, despite not having any of the common descriptors for such. The Big100K does NOT trigger on Sir Pwnsalot or The Reaper. Sir Pwnsalot is dead, not undead, and the Reaper ... isn't dead. Perfect Monster Smasher: Doesn't trigger on ice monsters if used with an ability that doesn’t receive stat bonuses. Some weapons still use "trigger by name" instead of "trigger by type". This will eventually be changed (and should be listed in the Encyclopedia entry for the weapon). Many scaling weapons (such as the Guardian Blade) will ALWAYS display the lowest-level damage, rather than having the display scale up. It still does the correct damage for your level. Weapons that have Player Stats on the Special (such as the Maelstaves and Shadowspear) will cause the Water Sign to function. Some shield triggers are activated on attacks that do not use stat bonus; others are not. Spellcraft - You can only have one element at a time. Questing for another element removes your current element when you find it. Having multiple versions of the spell does not increase the number of spell components you can carry. Some pets cover class armor skill descriptions. This is unavoidable. Hero's Charm: Cannot buy Hero's Charm even after all of the orb quests are completed. You must complete the Orb quests in order. Please see the Enyclopedia entry for the quest order. (Elite) DragonSlayer does not trigger on some things that Golden DragonSlayer (Eclipse) does, such as DrakBots and Wyverns. Flame Guardian Armor only charges up when the monster is listed as a fire monster. On the same note, fire monsters charge it up no matter what element their attack was. Knight Armor - Onslaught will heal you 1 HP per hit if you have less than 100 HP. Mage Robes - Can use Attack while training INT with Grimweld. Serpent Fang Gi skiill 6 increases Melee and Magic defence but says it increases Melee and Ranged. 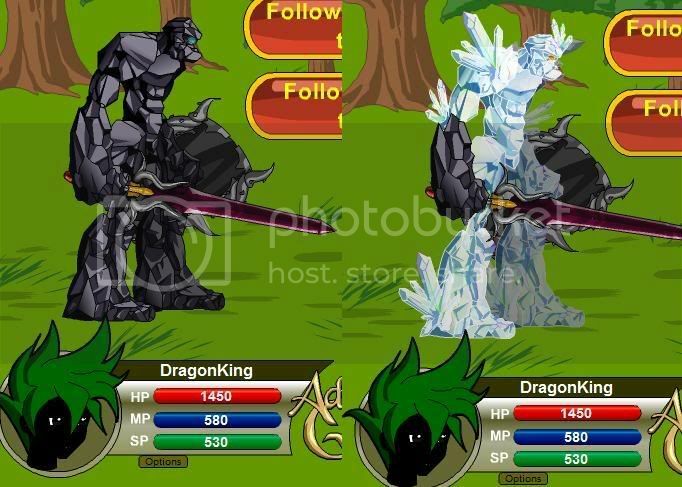 Shadow Cloak - If you change your face, your equipped Weapon and Shield are displayed in Battleon. Souvenir Boy's T-Shirt does not hold the weapon vertically on Special, so the Special goes the wrong place; this also affects selectable Specials like the Lightning Rod. Snow Golem Form - Weapon special occurs but is not displayed. Vamp - The life steal special on the armor will not hit more than 20. If you hit more than 80 the life steal will cap at 20 and will not hit 1/4 of the damage done as it should. Vampire Slayer armor - Player's right hand changes to default color when attacking. Vampire's Blood triggers on Name instead of Type. Warsmith - If an enemy misses, the element of your last attack is shown. Werepyre - In A Day in the Inn, your head replaces the fish head. This causes your head to replace Werepyre's if you are wearing it. It is fixed automatically after the next cutscene. Willow Plate - When the paralyzing attack is used, the first hit is always of the weapon's base element, even if the weapon itself is triggered or element seeking. Zardslayer (used with a weapon that changes element) displays the weapon's base element on the attack, but does the correct element damage. Workaround: Re-equip the temp armor. Giant head form loads default head when drinking potion and after death. Black Dragon Rider Armor doesn't load player head if player dies. Bullyfighter loads default head when drinking potion. Souvenir Girl's T-Shirt loads defaul head when an action is taken. If the default weapon or shield is equipped (e.g. by drinking a potion, changing armors) and you attack/cast a spell, the game may freeze. If your armor has an attack of a specific type or converts some attacks to another type (e.g. Melee to Ranged), the Armor's Type should be used instead of the weapon's type, even if the weapon also changes type. Equipping a 100% Special weapon while in Akriloth Form from the Akriloth Blade, and then changing Armors will cause the weapon to act as a 0% Special weapon. Workaround: Re-equip the weapon after changing Armor. Akriloth Blade: While using Undead Assault from the Lich form, the blade isn't shown, only the handle. Beast Trainer's Whip - Does not work with IronThorn or Berserker Hides damage boosts. Book of Death: listed as a spell, but does melee damage. When you defeat Angel of Darkness, the Dark Angel Spear automatically becomes your default weapon (there is no option to pick it up or not). If your graphics do not change when this happens, re-equip a weapon (the Dark Angel Spear will work). If you do not, the game may freeze if the weapon attempts a Special. Ion Cannon: The Special attack uses it's sound, even if sound effects are set to "Off." Mega Dragon Blade - When used with an attack like Undear Giant (does not take stats), the Mega Dragon Blade triggers but does not display that it has triggered. Nemeta's Conqueror used with Fighter Brutal Strike freezes the game. Rust Reaver - Does not trigger on Junkbot (monster issue). Shadowosken - Attack type is not displayed on the Special. Siren Spear: Special damages in description are wrong. Star Fusion - When the weapon is switched to Light, all attacks on the Special are Light instead of alternating Light and Fire. Stragath's Tongue does not seem to drop from Stragath's Head. Ultra Chain Axe: Second hit of the Special displays the old Ice graphic. Zardmaster Lance (Temporary) is Melee instead of Ranged. If your Armor has an attack of a specific element (e.g. Golden Dragonslayer and many class abilities), the Armor's element should be used instead of the weapon's, even if the weapon is triggered to do another element UNLESS the weapon is triggered to do Void damage. Certain weapons will override this even if the armor tells them not to. Typechanging weapons that start out as Melee (such as the Platinum Edge and Fruitcake Maul) are not boosted by Poelala. These weapons can also not be used in the Wizard Games. Eye of Naab/Father Time: If you lose MP from clicking on it, then try to cast a spell you no longer have the MP for from the Quick Spell Menu, the game freezes. Also, MP from using a Class Skill (and certain other equipment) is always restored, unlike form using a spell (Class Skills should be treated as spells, and only be restored when the full reset happens). Warsmith Shield Series: Does not trigger on Drone, Junkbot, Robunny, or Orc Horde. Spectrum Swirl spell will not deduct MP if monster only has 1 MP. Lawn Darts (series) displays the "you hit with X of the last 5 darts" message - even when you miss. ArchMage Research Shape Mana can kill you if you use it after using another item that does Void damage in the same combat. Poelala does not boost type-changing weapons that start out as Melee. Granemor (Captain/Lieutenant) Helm - does not deequip visibly from your character. The stat change is undone. When equipped over Fujin, the game freezes. Hero's Charm: Does not have an image when used. Mark of Hope: Message about empowering the weapon's special appears on Necromancer attacks and many class skills; no healing is performed. Layering issues are Graphics Problems, they don't go here either. And no your arm will *not* stop displacing a special. Due to the way things are done its not possible, if the special would cover your arm, so would the weapon, and obviously your weapon belongs inside your hand. 1) CHECK if the bug has already been reported, if it has your "Me too!" post is unnecessary. This means that you need to check the first post in the thread AND the last few posts in the thread, which may not yet have been confirmed or added to the first post. If you are providing additional information, or a way to work around the bug, please post. 2) Do not respond with "That's not a bug" posts. AKs are welcome to edit such things in to the post though. You may however respond if you have a way to solve the bug, such posts are welcome. 3) No pictures! Links to pictures should be used instead. Also please do not use Bitmaps for the pictures. Convert it to a more space efficient type, such as JPEG or png. 4) If your bug is fixed please delete your post. 5) Make sure you're posting in the right thread. 6) Please include ALL of the information in the template in the first post! It may not seem necessary, but these little details often allow the bug to be found. 7) If your post mysteriously disappears, it was probably deleted for violating one of these rules. Rest assured that it WAS seen, and was not a necessary post. Has this bug been reported before? Unless providing new info please do not duplicate reports. Did the bug happen again? it has 140% to wind damage. I had fenris gasher equipped, 8-29 damage. I clicked attack, and the armour did a single hit, of 11 damage. This is far below what even the base damage should do, if the above stats are correct. Possibly it's a problem with the level-scaling on the shiny boy? In other battles it was hitting very low, but just inside the range of what's possible of random damage was 0, only base hit. This was odd, but attributed to the RNG. but the hit of 11 made me report this. Hm. I'm getting damage that looks quite reasonable - but I don't happen to have a character in that tier. I'll have to look into this in more detail. Please check back in a day or two, I'll try to let you know what I find out. Shape Mana is still doing the player instant kill. I've noticed this only happens when another spell has been cast before you use Shape Mana. As long as the only spell you use in a battle is Shape Mana, it appears to not do the player instant kill. seemed to match this glitch. and again the shield's special reset it's HP. After bug: removed shield so that battle could progress. When I was trying out the new Christmas Armor Arthimate Coal Armor, I just triggered the armor in battle, fought 2 more, and when I hit a cutscene, it started switching from normal to trigger appearnce back and forth incredibly fast. When I entered the next battle, it went back to the triggered armor. EDIT: I figured out this only happens if you enter a new scene without falling from the top as a giant piece of coal, and you dont have to be triggered for it to happen. When I use Panforte Maul (melee mode) in Asgardian Plate, the first hit is not converted to Ranged. Bug details: ArchMage Research III, option Shape Mana spell caused instant death to the player after dealing successful damage to Sectus and Ziragat (undead dragon). Sectus: Fought Sectus during Hedge Maze quest. Equipped Water Sign before using Shape Mana. Nerfed 4 times by L50 Nerfkitten. Had special for Raynar's Ultimate Blade go off (at least once). Had lowered its HP low enough to finish it off with Shape Mana. Ziragat: Battled Ziragat (undead dragon) during RA. Successfully nerfed by L50 Nerfkitten 4 times during battle. Special of Raynar's Ultimate Blade went off once during battle. Equipped Water Sign. Used spell Great Pumpkin Patch one round before using Shape Mana. HP lowered to around 1,100 (I think). Sectus: Had around 620 HP? (This was last night, so details are sketchy at best). Used Shape Mana; spell finished off Sectus (200-290 HP damage), but also reduced my HP to 0. Ziragat: Had around 450-550 HP. (Battle was a few hours ago). Used 1 round after Great Pumpkin Patch spell. Shape Mana sucessfully dealt damage (150-290 HP damage range, I don't remember well enough, though) to Ziragat, but also reduced my HP to 0. After bug: When I saw my HP reduced to 0 in both scenarios, I X'd out the browser, confirmed I wanted to navigate away from the page, and that was that. Did you clear cache? After Ziragat: Yes, earlier today. After Sectus: No. Did the bug happen again? No; have not faced another Sectus or Ziragat yet. i just finded a aparent bug wit a spell effect. like wat going on ? i cast 2 spells and ONLY 2e spell get Divine boots effect, not Nex cast after Divine boots. there a tactic i ben bulding for a wyle and improving it, Mage no-Endurence long batle survival tactic... if that divine boost dont work on the Healing Spells, it wil just be unfair. CONFIRMED: Ranyar's Ultimate Blade special causes the Shape Mana spell to glitch in this fashion! If RUB's special goes off, cast Shape Mana, and it successfully causes damage to the enemy (if it blocks, it doesn't happen), it reduces my HP to 0! Lesser Droag is a zombee kind monster (zombee=undead), but the sword dose not change for holy element wen batling a Lesser Droag. BIG 100k Sword is suposed turn to holy element agains all undeads, but it stayed Darkness element agains that Lesser Droag and Nightraider monster. Also, Wepons grafic change due to special effect are Triggered WEN YOU EQUIP THEM. but Shields are trigered AFTER FIRST TURN ENDED wit the shield newly equiped, so it become harder to just know if a shield add or not a bonus agains a monster, unless to take the risk to lose a turn (wich anoying, and somtime a crutial turn is lost). Also i ben Having a double-click bug wit my mouce latly (wich is not related to your game, like a turbo double-click, BUT ...) wen it double click on a button to change scene, wel the scene Freez at black screen. Since it so rare the timing of that random bug (mouce 1.5 year old only ...) it Freez rarly, but it dose hapend few times. Noted the Nightraider (that would be a monster issue). Lesser Droag is neither a zombie nor is it undead - it MAKES zombies, it isn't one itself. Zombies are also not exactly undead. Not much I can say about the Shields. The trick there is probably that many shields trigger for some attacks and not others (for example, Cheiftain's IronThorn now triggers on Player Attacks and Specials but not on percentile-draining attacks or spells). I'm not sure if it's possible to change this or not. wen i KILL a monster in 1 HIT/1Skill/1Spell cast, wich happend a lot wen doing half of the quests in game (wen you are lv 80+) WY that STUPID message after batle rewards [WAIT/SAVE] (each time, not occasional) before it change to NEX. the problem is that it usualy LEAST for 10 to 30 segonds (each time, i counted, each time i 1 hit the monsters that t low lv and dont even gimme exps). im using the newest Firefox and Flash, but that bug happened on old Explorer V ... V7 i tink, i also got a different internet company than last time and ALWAYS hi-speed acces, and no others tings doing a singificant use of internet (im always at 8% of speed capacity, of not lower, so it cant be MY internet connection to your server). so i tink it a connection bug, due to the fact that wen the batle log in, and kill it in 5 segonds, it make me wait in "line" before i can reconect to the server and save the game state/change to nex scene. that bug is REALY Anoying. i only gained 2 lvs, and i cant get more ... as a X guardian it would be normal to have BETTER exps limit than normal aventurers (i tink i saw somting about that somwere on forum, telling that the exps gain was same for Aventurers and Guardian, Xguardian +10% exps limit due to exps gain). Asgardian gets 100% Stats per hit; that's the default if nothing is stated. This means that you lose 50% Random and gain 100% Stat when you get the second hit - a slight improvement (if you have reasonable stats for your level). Undead Mutant is known to be overpowered. Don't worry, we're planning on fixing it. Some triggered items add damage to attacks that do not use stats; others do not. It depends on the item. If it's not mentioned, assume that the item does not. That's not a bug. The delay is to reduce the strain on the servers (and to also make it less abusable for people to just go out and kill Frogzards with a L100 character). Bug details: It's a problem with Eye of Naab used in conjunction with Mage Robes. When you use just one skill, it seems the 10% full regeneration effect works the way it should, but if you use more than one skill, I've noticed that I have regained my spell mana (all mana, not just the mana I use on the class skill) almost every time. The special effect of the spell can't be kicking in, furthermore, because I don't regain health except from the last turn of the battle (I've been letting the monster attack me first so I can know if I'm just having a run of good luck). During Bug: I regain mana? After bug: Game continues normally. Did you log out and log back in? It happens every time I battle. Did you clear cache? Yes. Did the bug happen again? Yep, keeps happening. I know Eye of Naab will be changed anyway, I just figured I'd post so it's a known issue. bug: after the special of liquefactor, ice defence of an alpha dracowolf became NaN (not a number, I suppose). Pretty sure Ultra Shifter Bow doesn't do correct damage with either CIT or Berserker Hides, unless it's been fixed. on the old Armor/weps/shield/spell/misc bugs topic, my post never got an answer. their special HAD the same 30% degree diagonaly angle wen normaly it NOT inclined on all others armor. Also the Lyfang Water sword is a Rare that normaly trigger a bonus damage ANd element seeking on Zombees, but the monster **MechaZombee** dont trigger it (he is weak agains light 140% and water 120%, so the element seeking trigger on zombees should turn it in light instead of water). Also Ultimulus shield dint trigger agains the **Nightraider**, **Dracowolf** AND the **Alpha Dracowolf**, (since it a vampire, vampire is a short of undead so it should work on it). short of anoying, since it not always aliable to have a litle healer before a event continue. This present event, agains Wold King, if you die the event succesfuly end but keeping you to 0 hps AND it give the choise to try again, make auto-death if you press Try again. Also, Big 100k dont triggered againsd **R0tting Corpse Zombee** monster, neither Ultimulus shield. Bug details: I cannot move the Blue Mhurble around in my inventory nor move anything past it. Before bug occurred: Doesnt matter what I do before it never works. During Bug: Cant move pets passing the Blue Mhurble or move the Blue Mhurble itself. Other Equipment: All of my other pets that I cant move up and down passing it. Did you log out and log back in? Yes I did. Did the bug happen again? Yes i still cannot move it or anything past it. EDIT:I actually just found out that its not the Blue Muhrble its any pet thats in my 4th pet slot.The first four pets cannot be moved into the fifth slot and the pets after the fourth slot cannot be moved up into the fourth slot, if I try to move the pet in the fifth slot up into the fourth it just doesnt move. EDIT:Still doesnt work,I logged out for 39 hours and cleared my cache. you quest to GET all elements Copomments, and wen you CAST the spell, it ONLY use the LAST element Coponent you quested for. So it make only possible to get 1 element at a time on that spell. But wen you do the quest, it appear that you CAN quest for more than 1 element, even warlick ask if you want to quest for other element after you finished a coponent quest, but if you accept, it will just delete the previous element coponent you just farmed. Wy would he ask us to go collect a other element IF it is to DELETE the element we just collected ? Also, The Healing pants (specialy Epic healing pants im using now) it heal abillity offen trigger in the MIDLE of the nex turn, instead of AT the end of the batle turn. Browser Info: internet explorer? Dell?what does this mean? **Vampire Bat** monster, but all other wepons/Shields agains vampire did triggered. it would also be great to see some glowing on that shield WEN it trigger, that way it would be easyer to know if it trigger or not, than just checking the size. Also The **DracGuard** Shield dint triggered agains a **WereWolf Warriror** lv 50, in the 2e save-the-moglings story-quest. it normaly a shield that incrase damage agains lycans and vampires. Seriously there almost NOOO werewolfs that trigger that shield IN the save-the-moglings from werewolfs and vampires, in the 3 buttons quest. it dint worked agains a **werewolf Warrior** and neither agains **alpha Werewolf** and neither agains **Vampire Lord**. i did tryed uequip it wit different armors, and change shield and use it again. it might be a zone problem IF i go try this shield IN few OTHERS werewolfs and vampire zones. realy werd, i went to try the shield in a other quest wit vamps and werewolfs, and the shield refused to trigger on few monsters wit Obsidian necromancer Cloack, but not wit Epic healing pants. Wel finaly THIS problem is not a monster probl, it just that the shield **DracGuard** ONLY trigger WEN you use ATK button, then keep triggered wathever you do. but if you first use the shield and a Wepon Special trigger, use a class skill or Cast a Spell, the shield DONT trigger since it only trigger IF you use normal atk hits, but keep triggered wathever you do after. -Grafix Bug, on **Epic Healing pants** armor, the hand holding the shield is normal SKIN collor, BUT the hand holding the WEPON is NOT Skin collor (skin collor= face collor), the wepon hand apear to be normal clear skin collor. There also a ting that becomming anoying, each time i go in a shop it reset my armor/shield/wepon to standar like if i just loged. And half time i go in a quest that there a *guest grafix* that NOT batteling wit me, it remove my 2 **Best master pets** to leave a empty spot. it ben happening kinda offen, for latest exemple, ZardHunter quest part 1, and many others quests like in the #1-25 Devorour. idk exacly wat this bug is about but my 2 beast master disepear each time.